Gluten free, Dairy free & Paleo friendly Granola bars – life is good again! As a mom of a third grader, I’m often on the hunt for quick, grab-n-go foods that I can pack in my bag or send in his lunchbox. 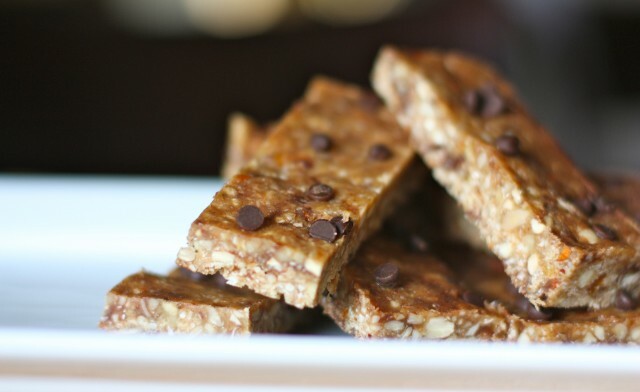 And as someone who lives a Paleo life, coupled with a handful of other food restrictions that many of the Paleo approved convenience bars contain, I’ve had to discover recipes I can make myself. While I love the convenience of healthy, gluten-free friendly bars such as Larabars, Thunderbird Energetica, Kind Bars, etc. I’m not able to eat most of them. The biggest culprit for me in the handy grab-n-go bars is almonds, and I have to admit that of all the foods I’m currently reacting to, my two hardest to avoid are garlic and almonds. I’ve grown used to cutting out gluten and dairy, but almonds and garlic were pretty regular staples in my diet. So in a quest to find a yummy (and Gluten-free, Paleo approved) recipe to replace the Larabars of my past, I ran across these dark chocolate peanut butter “granola” bars created by Danielle, of Against All Grain. If you don’t know about Danielle, or her never-ending quest to bring us healthy, delicious and grain free foods, you should. She’s dedicated to the grain-free cause, and has helped thousands of families learn how to live grain-free while still enjoying themselves. So, check out her recipe here and if you’re looking for a similar recipe that uses Coconut Oil, be sure to check out these Coconut Oil Chocolate Almond Bars or these Frozen Coconut Oil Chocolate Banana Bites which we make every week. For the full ingredients list and recipe instructions, head on over to Danielle’s site here. She not only lists the steps for us, but shows pictures along the way so you can prep these tasty little guys with confidence! Comment below once you try these! 2 Pings/Trackbacks for "Homemade Dark Chocolate Peanut Butter Granola Bars (Gluten free, Paleo)"